Becoming a Choral Music Teacher: A Field Experience Workbook, Second Edition is a choral methods textbook that prepares students in Music Education to become middle school and high school choral music teachers. It emphasizes important musical skills, vocal pedagogy and repertoire suitable for secondary school choirs in order to provide future teachers with the critical experiences to be effective. Focusing equally on rehearsal strategies, auditions and classroom management, the book is also a "workbook" that requires the students’ active learning through participation in fieldwork. Students learn in a sequential and practical manner, beginning with the study of the middle school voice and progressing to the high school voice, through practice of theory with adolescents, followed by class reflection on common problems and solutions, and then continued practice. 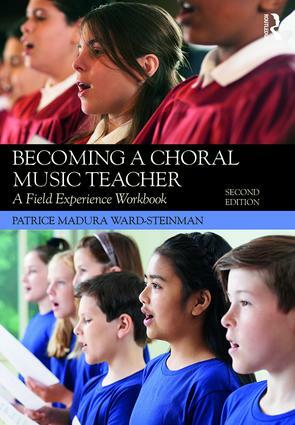 Becoming a Choral Music Teacher: A Field Experience Workbook, Second Edition fully integrates the choral field experience for hands-on learning and reflection and allows the student to observe and teach the book’s principles. Patrice Madura Ward-Steinman is Professor of Music Education at the Indiana University Jacobs School of Music. She has directed elementary school through university level choirs and currently teaches Choral Methods, Choral Literature, and Vocal Jazz.